Do I look like I do "cute and pretend scary"? Jax, from where I am sitting you ARE cute, and you don't have to PRETEND to be scary. Yes, you own scary. RG, is that SUTTR? Rachel, Speedy is too good and sweet to be scary, except of course when he is out fighting the forces of evil. 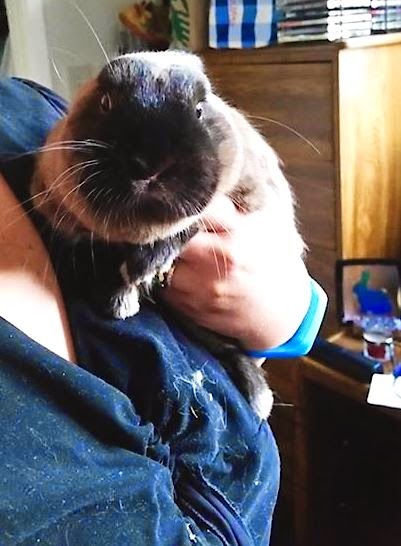 If I saw this disapproving mouf looming in the darkness, I think I would be scared. Sure, RG. No chance of those who have long ears the better to hear you with overhearing your pious admonition? Jax baby! I love your Otter Bunny look better. Too bad, Halloween is too scary for you.